When Father Arsenios had gone to the Holy Land for the fifth time, a woman by the name of Sophia got into his cell through the window, not to steal anything, but for revenge, because he had been very strict with her about some nasty things she had done in her life. While her husband, who was with her, waited outside, Sophia got inside and turned the whole place upside down and knocked everything over he had in his cell, even the Crosses and the Gospels. In fact, they say she even evacuated her bowels on the sheepskin on which Father Arsenios used to kneel and pray before his icon-stand. "What was that you did? Not even an impious Turk would have done that, throwing the Gospels and the Crosses on the ground." But Sophia, unfortunately, instead of repenting and asking forgiveness started using bad language and swore at Father Arsenios shamelessly. "You'd do better to have no brain at all than the one you've got, child, because that one will see you in hell. So I'm going to beg Christ to take it away from you, that at least you'll be judged as a madwoman, and in that way your soul will be saved." And, indeed, from that very moment, Sophia lost her mind, and from the wild beast she had been, she became like a baby, a little child with no harm in her, smiling innocently all the time. She lived for a good number of years here in Greece too. This is known to all the Farasiotes, only that some have misunderstood Father Arsenios, because they thought he had cursed her. But the way the President told me, and the others, and the way I see it myself, he not only did not curse her, but in this way actually blessed her and assured her entry into Paradise, because only sheep go there, not wild goats. This was also the opinion of the serious-minded Farasiotes, that in this way Hatzifendes saved Sophia. 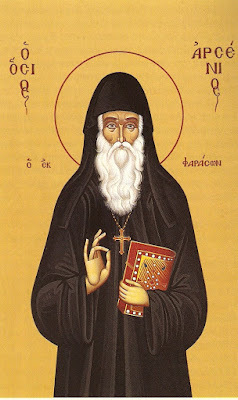 From the book Saint Arsenios of Cappodocia, Souroti, 1989, pp. 112-114.